ROLLING MEADOWS, Ill., April 25, 2011 -- Northrop Grumman Corporation (NYSE:NOC) received the Diamond Award for Excellence from the Federal Aviation Administration (FAA) for the company's ongoing commitment to maintenance training and safety during a ceremony held at the company's Rolling Meadows facility on April 14. The Diamond Award for Excellence is the FAA's most prestigious maintenance training honor. 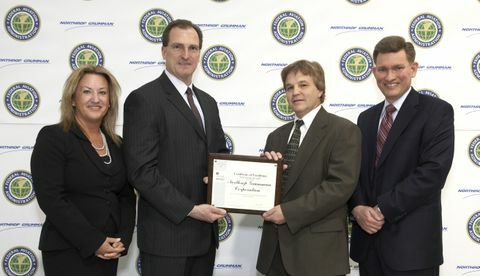 Northrop Grumman's Rolling Meadows FAA Certified Repair Station began operation in May 2009 and was established to meet regulatory requirements for customers operating aircraft under civil aviation rules. "Having an FAA Certified Repair Station at our facility demonstrates our commitment to our customers and an understanding of their needs," said Carl Smith, vice president of infrared countermeasures for Northrop Grumman's Land and Self Protection Systems Division. "By earning this award we have demonstrated our focus on continuing education and our desire to produce the safest and highest quality aviation products."